We are members of the Ramblers, Now over 120,000 strong in U.K. we enjoy not only local walks but those organized, around our area, provided a suitable pub stop is arranged half way round we can put in some distance in a day. The Annual Ramblers handbook is great source of Bed and Breakfast, and walking locations. Keep Right On Rambling ! So may I introduce a quotation, from our walking group. How do you tell if people enjoy walking? Answer = Just look at the smile they leave behind when thay have passed! 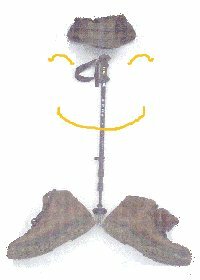 To prove it here is a photo of a walkers gear, with the smile still lingering.